Paleontologists recently announced the discovery of a new species of prehistoric marine mammal, found in Unalaska. While the fossils were discovered many years ago, the announcement in early October that they were of a separate species was new information. Ketchikan artist and self-described paleo-nerd Ray Troll had an inside line on the story, and contributed illustrations of the new species for the scientists. Ray Troll has made a name for himself among the nerdy set with his scientifically accurate paintings, most often depicting fish and, more recently, extinct creatures known only by the fossils they’ve left behind. Troll arrived at the station carrying a fossil that someone gave him many years ago in Oregon. Troll said that person thought it was a fossilized tooth from an ancient horse. The tooth is an odd-shaped square, a little more than an inch on each side. It’s made up of columns, each about the width of a pencil, and one edge of the tooth is worn smooth. Troll said Desmostylia’s name comes from its unusual dental development. Desmostylia lived for about 23 million years, and then just died out, leaving behind its fossils. Johnson was the connection between Troll and Dr. Louis Jacobs, a Texas paleontologist and one of the researchers who determined that the Unalaska fossils were a previously unidentified species. Jacobs said he had been at the Smithsonian, looking at Desmostylian skeletons, and was about to leave for the day. Jacobs told Johnson about his research, Johnson passed on the information to Troll. The next day, Jacobs got a call from Troll, and, long story short, Troll soon was working on drawings of a newly identified extinct species of Alaska Desmostylus. Now, some of these fossils were dug up a while ago – in the 1950s — but Jacobs said they were misidentified. The research team spent a lot of time studying the bones, along with other more recent finds that had been in the Museum of the Aleutians, to make sure it was a new species. And, it was. The researchers decided to honor Troll for his contributions, so from now on, a group of Desmos will be called a troll. The troll of Desmos fossils were found where Unalaska’s Eagles View Elementary School now sits. Troll said he’s suggested to the principal that the school change its mascot to the Fighting Desmos, and offered to draw the new logo if the school agreed. “I got sort of a curious silence,” Troll said of the school’s response. But, he said, it would be a unique school mascot and would honor a prehistoric creature that’s indigenous to the area. The school has, though, and will continue to use the Desmostylus discoveries as a teaching tool for students. “It’s something that we can go outside of our curriculum, and study a little bit more in depth and get kids excited about studying the past, not just our cultural past, but prehistoric past,” he said. Troll is contributing to that effort, as well. He’s sending the school a framed print of a Desmostylus, and Anderson said they’ve already picked out a spot to display it. 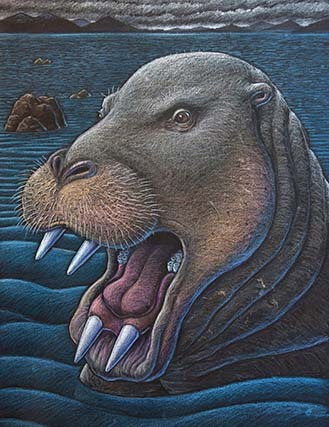 It had the face of a walrus, swam like a polar bear, was as big as a hippopotamus and sucked its food off the rocks and mud around the Aleutian Islands 23 million years ago. “Ounalashkastylus tomidai” was described by a team of paleontologists from Texas, Canada and Japan in an article published in the scientific journal Historical Biology on Oct. 1. 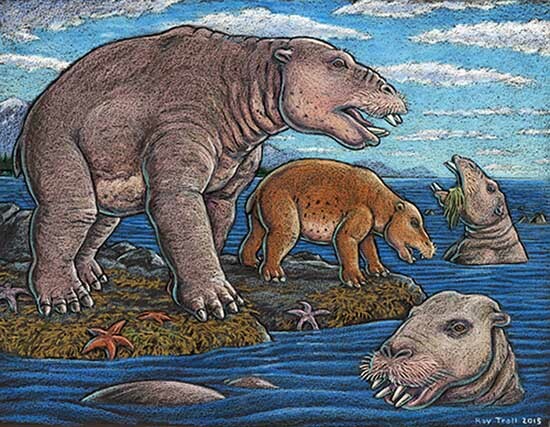 Louis L. Jacobs, a vertebrate paleontologist at Southern Methodist University in Dallas and co-author of the study, said in a press release the extinct marine mammal was a vegetarian with a long snout and tusks. It grazed on plants growing along the shoreline, rooting them out then sucking them in like a vacuum cleaner. It was a style of eating not found in any other animal. The new species, a member of the order Desmostylia (des-mo-STILL-ee-uh), was identified from four specimens found on Unalaska over a period of years beginning in 1950, when fossils were discovered in a quarry. 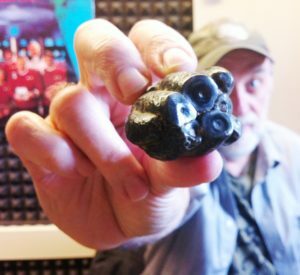 More emerged during excavations for the foundation of Eagle View Elementary School, said Alaska artist Ray Troll, an avid follower of paleontology and illustrator of extinct animals. Anthony Fiorillo of the Perot Museum of Nature and Science in Dallas, another co-author of the study, told Alaska Dispatch News the find involved a good deal of serendipity. Fiorillo, who has made several important paleontological discoveries in Alaska, had planned to work in the Yukon-Charlie area in 2004, but wildfires and smoke made that impossible. Though it had legs, it was primarily a marine animal, Fiorillo said. “Pretty much like seals, it could go on land, but you wouldn’t find it roaming the landscape.” In the water it would have used its powerful forearms, like a swimmer doing a breaststroke or a polar bear. The fact that several individuals were found in one place indicates they lived “in some sort of cohort,” said Fiorillo. And, as a group of lions is a pride and a group of cows is a herd, Jacobs has proposed calling cohorts of Desmostylians a “troll” in honor of artist Troll, who has made paintings of the animal among his many other paleontological renderings. Fossils of other Desmostylian species have been recovered along the Pacific Coast from Baja California to Japan. The Alaska fossils, which are different from the others, are the farthest north to have been found. The name of the new species combines Unalaska with a description of the animal’s unique, column-like teeth. “Tomidai” honors Yukimitsu Tomida, a Japanese paleontologist who has done research into Desmostylians. The fact that Ounalashkastylus came to light at all still makes Fiorillo chuckle. “Who would have imagined that the boreal fire cycle of Alaska would lead to the discovery of a new marine mammal in Unalaska?” he said.